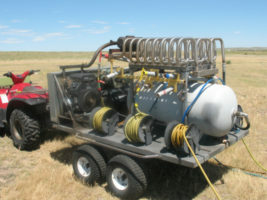 When you arrive to lease the PERC machine, you will pick up a trailer containing the PERC machine, and an ATV to transport the PERC equipment through the area being treated. Both pieces of equipment will be fueled; dependent upon your treatment area and infestation levels, you may need to re-fuel during your lease time. When you schedule your lease, we will go over standard calculations to determine infestation levels, and determine the lease time/estimated costs for your restoration project. The PERC machine has six treatment rods (three on each side), with attached feed hose of approximately 50 feet, (color coded to ease in use), providing for the treatment of 6 holes at a time. 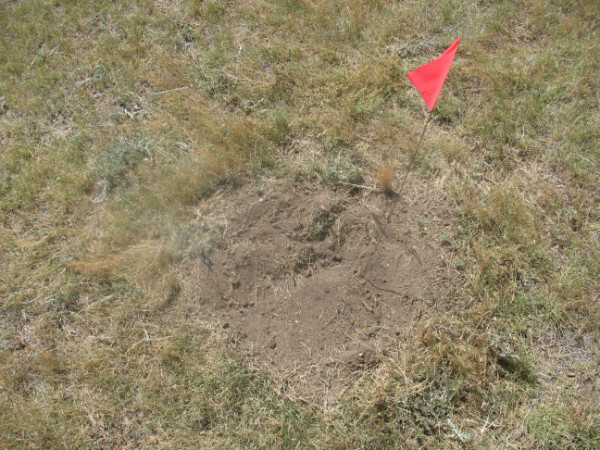 While 6 hole treatment in one area is not always possible a little “boots-on-the ground” walking time to identify and pre-mark holes for treatment, to plan your treatment route, can greatly reduce your overall costs in restoring infested land. 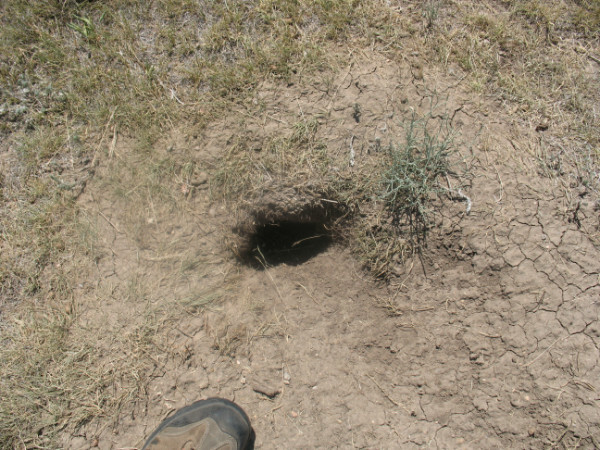 Abandoned prairie dog burrow entrance, with dead vegetation/blow dirt. 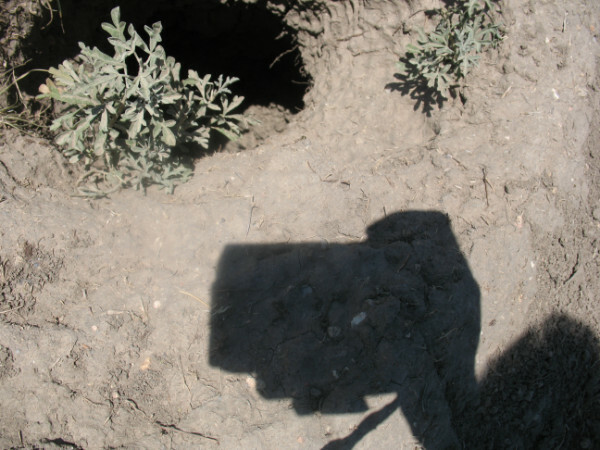 With a 2-person team and/or, pre-planning, identifying active burrows and filling in abandoned ones ahead of PERC machine arrival can streamline the treatment process. Loosen dirt around hole, for use to seal treatment and fill in after treatment. 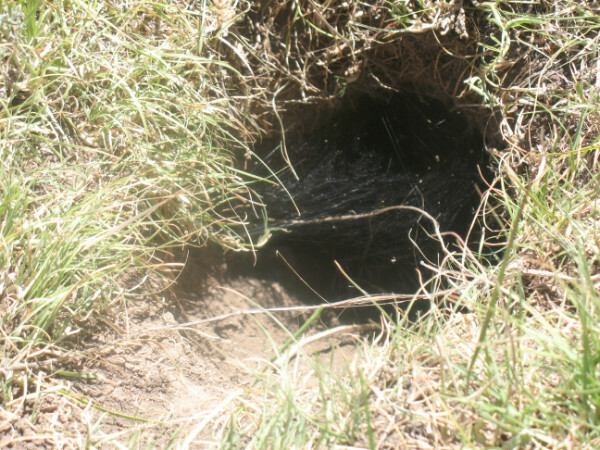 Insert treatment rod as far into burrow as you can, then cover top area well with dirt, to seal and ensure maximum delivery of treatment. 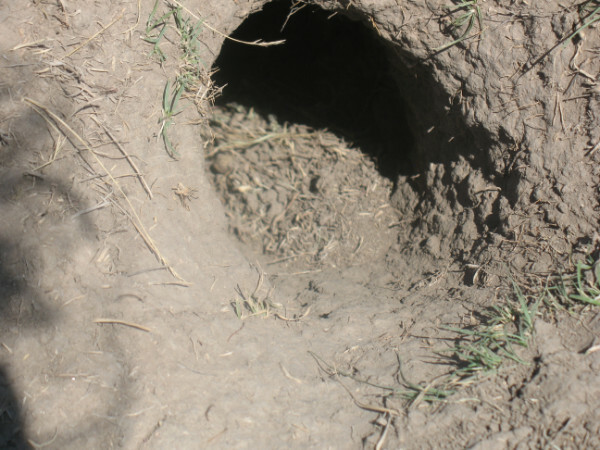 Place treatment rod in burrow, as far as possible, for effective treatment. 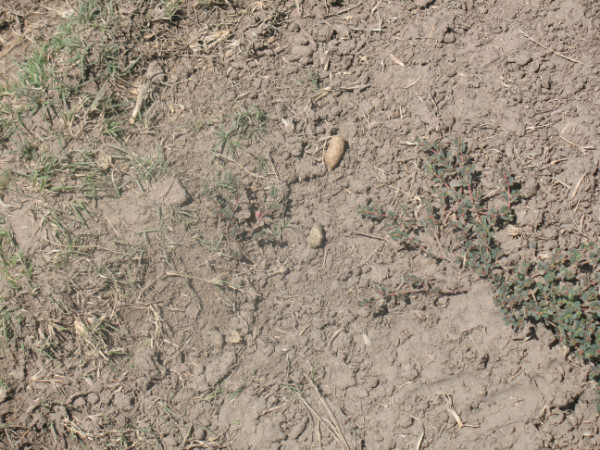 Once treatment started, watch for bubbles in dirt and/or blowing dirt to indicate where good seal has not been accomplished – correct any leaks by simply adding more of the loosened dirt to create a better seal. 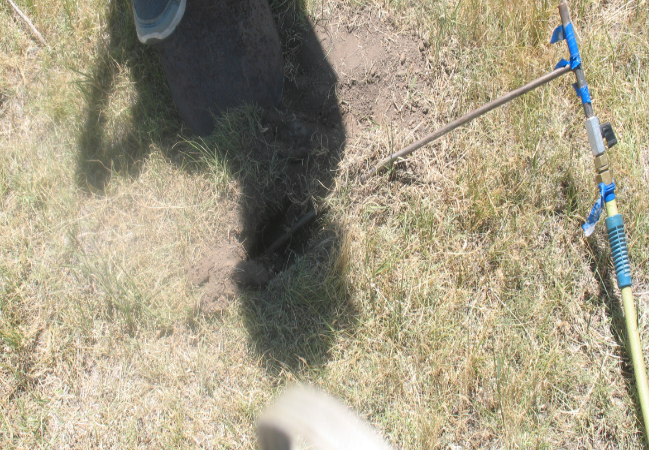 A 5-7 minute time frame of treatment is recommended, per hole, for maximum effectiveness and cost-efficiency. Timing need not be exact, however, less time may not be effective and more time simply increases treatment costs, without increasing results. 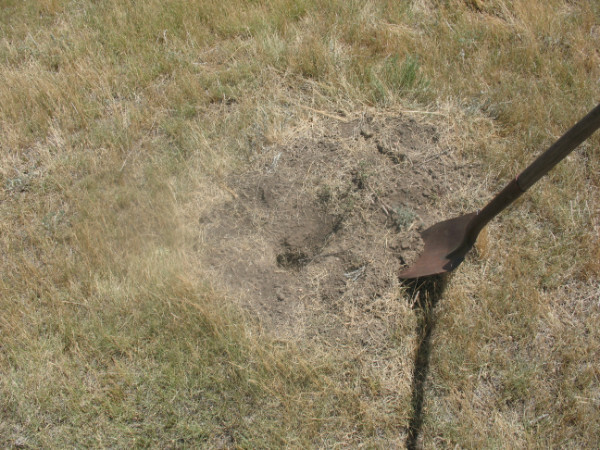 Once the window of treatment time has been reached for a hole, remove feeder rod, fill in hole and mark to indicate burrow has been treated. A follow-up treatment in 4-6 weeks is highly recommended. 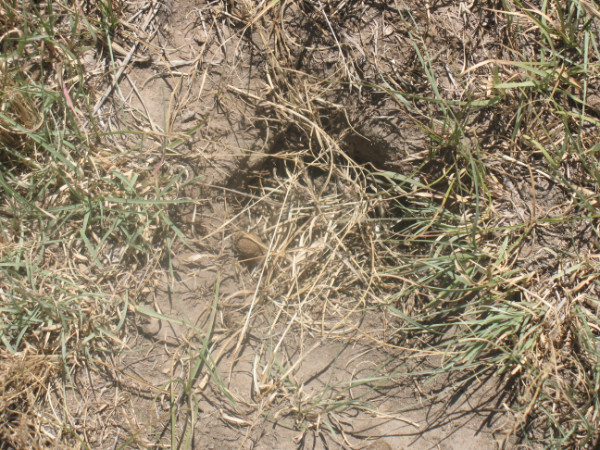 With high levels of infestation, you may need to re-seed treatment area with native grasses to fully restore the land. 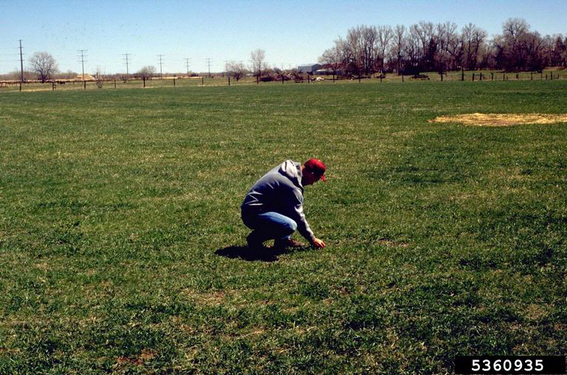 We carry a variety of general mixes, or Contact Us to custom mix a blend to meet your restoration needs.